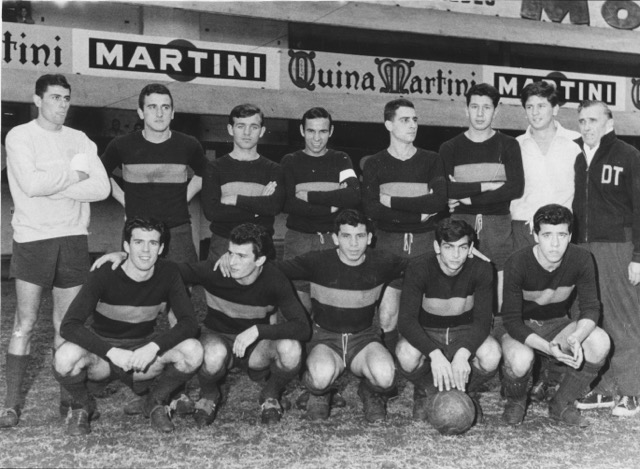 Peter Millar, kneeling far left, at Boca Juniors in Buenos Aires. Photo: Courtesy of Peter Millar. It was an absolutely absurd scenario—a semi-professional soccer club based in New York City being a “nursery” for the world famous Boca Juniors of Buenos Aires, Argentina—but two young Scottish-Americans arrived at the South American club in 1963. This unlikely trans-Atlantic transfer and the journey a young Pete Millar took to get there and back still resides in the shadows of American soccer history. Born in the small seacoast town of Saltcoats, Scotland in 1942, Peter Millar was the son of a soccer player. His father John played in the Scottish First Division for Aberdeen FC prior to the Second World War, and passed on his love of the game. Pete began playing at age 6, signed with Kilwinning Rangers, a member of the semi-professional Western Ayrshire League, at 15, and dreamed of a professional soccer career. There was even talk of a trial at famed Glasgow Rangers, but at 16 that dream seemed to evaporate when his family immigrated to the United States in 1959. The Millars settled in Union City, New Jersey, just above the Lincoln Tunnel up along the Palisades of the Hudson River, and since the local high school didn’t have soccer, the lanky yet athletic Millar ran track. To satisfy his soccer itch, Pete joined West New York SC of the German American Soccer League, and according to a local newspaper, he was “a boy who stepped into a man’s league.” Yet the outside right forward was most definitely not out of his league, scoring 80 goals in 34 games. Millar even scored eight in a 12-2 thrashing against a side full of Lativians at New York’s Central Park. By 1961, Millar’s scoring feats caught the eye of Enzo Magnozzi, the owner and manager of the Queens-based Inter SC. Magnozzi, who immigrated to New York from Livorno, Italy as a teenager in 1931, played for the Flatbush Wanderers, New York Hakoah and several other clubs in the late 1930 and early 1940s. He also boxed under the name Tony Mango. The tough and imposing Magnozzi coached after his soccer and boxing days were over, and he claimed to discover Joe Gaetjens, the scorer of the famous goal for the USA against England in the 1950 World Cup. In 1960, Magnozzi formed Inter SC and a year later bought a field in Flushing to showcase his cast of “imported players.” “That is the reason management has named the team International Soccer Club,” noted a club bulletin, “because soccer belongs to all nationalities and for all people to enjoy and criticize for their pleasure.” Magnozzi, who would go on to promote international games in the U.S., treated Millar, one of three Scots in a squad full of Argentines, like a son. And, his international contacts led to the young Scot being scouted by Boca Juniors. “It was a big shock getting asked to play for Boca,” recalled Millar. Almost all of the press on Millar and Waugh commented on their Scottish roots. One account in La Voz de Buenos Aires joked that “The Scots at Boca Played Without Kilts” and La Razón mentioned other vital information: both men were single and didn’t have girlfriends. Life in Buenos Aires seemed like a whirlwind at times. At training, some of the players used to make fun of them, calling them “English” even though they knew they hailed from Scotland. Ever “el goleador,” he also scored a dozen goals in twenty matches to remain near the top of La Tercera scoring chart. The new Boca forward relished La Tercera matches on Sundays, and at times, 20,000 to 30,000 spectators watched the Under 21 matches (2,000-3,000 came to training sessions). 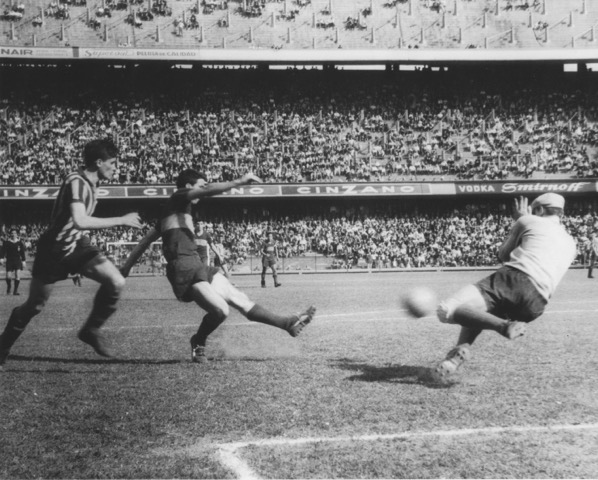 At one Superclásico a jammed-packed Bombonera watched Millar deflect a punt from River’s goalkeeper to a waiting teammate to score the game’s only goal. It denied their rival the championship. Millar scoring for Boca’s La Tercera against rival River Plate at La Bombonera. Photo: Courtesy of Peter Millar. The nadir of Millar’s first year came after the season was over, when he and several friends went to a beach for a kick-about. Although not yet a United States citizen, Millar held a Green Card and soon after he arrived back in Union City on crutches, he received a letter from his draft board that he needed to report for a physical exam. The military doctor told him to put his scarred foot on the examining table, and as he backpedaled some twenty feet away, he simply said, “That looks good from here.” The ultra-fit, yet injured Millar had hoped he could get a deferment so he could return to Boca. He passed the exam and his deferment was denied. Millar believed his future was back in Buenos Aires, not Vietnam, so after seeking advice from an attorney he wrote the draft board to inform them of his intentions to return to Argentina. “I wasn’t a U.S. citizen so I could legally write a letter saying I was a professional soccer player, and if the draft board needed to reach me it could do so through the British Embassy in Buenos Aires,” he said. Completely healed, Millar sought a place in the first team since he was now too old to play for La Tercera. On April 22, 1964, his dream came true and he signed a professional contract with the first team for $120,000 pesos a year plus playing bonuses. “It wasn’t much in terms of U.S. dollars, but all told, we were probably making ten times more than the average Argentine working man.” A copy of that contract still proudly hangs on his basement wall. Pete moved from a downtown hotel to a boarding house for his second year, and he was now on his own because Bobby Waugh left the city for Club Atlético Rosario Central. As a member of “el plantel professional,” Millar now trained with such luminaries as midfielder Antonio Rattín, goalkeeper Antonio Roma and defender Silvio Marzolini, all members of Argentina’s 1962 and 1966 World Cup teams. Omar Corbatta, a veteran of the 1958 Argentine World Club side, played right wing, so in order to get games Millar often dropped back to play right back. There he joined Orlando, the Brazilian who won the 1958 World Cup. Millar was surrounded by world class players, and while he never played in a first division match, he did play in first team exhibitions, including one against England’s Stoke City at La Bombonera. He saw more time with the reserves. As Millar progressed as a young pro two things nagged at him: his inability to get paid in a timely manner (a common problem for players in South America) and a draft notice from Uncle Sam. The combination of the two eventually led to his return home. One day Pete opened a letter from his mother, which bluntly stated: “You’ve got to come home. You’ve been drafted.” Pete ignored the plea and kept training and playing, even though he wasn’t always compensated for his efforts. Despite all his progress as a player, Millar started to consider going back to New Jersey. And then there was a near-death experience out in the Argentine countryside as Boca returned from a match in the interior. The driver of the first-team bus mistimed the approach to a one-lane bridge early one morning and slammed through a railing. The whole right side of the bus hung precariously over the side of a ravine, so players had to kick out windows on the left side in order to crawl to safety. “It was so scary. We had to walk over an hour to find a town and get another bus,” said Millar. The horrifying ordeal didn’t make Millar decide on his future right then and there, but he thought continuously about what he should do over the ensuing months. He asked friends, including Enzo Magnozzi, for advice. “I had to make a decision to stay in Argentina and lose my greed card, or give up on a dream and go back to the U.S. There were rumors about a pro league starting up, too. Because of the money situation, I just said the heck with it and went back to the U.S. before the season ended.” A few weeks after he made the fateful decision, Boca won the 1964 Argentine championship. Minutes after Millar arrived at New York’s Kennedy Airport, he was stopped because his name was on a list of those avoiding the draft. The FBI agent said, “I would advise you to report to the draft board as soon as possible.” Pete did and within a month he was at New Jersey’s Fort Dix. Four months later, after a training stint at Oklahoma’s Fort Sill, he was shipped off to a nuclear weapons outfit in Germany. There he played for the army’s CISM soccer team. Discharged from the U.S. Army in 1967, Millar returned home to once again play for Inter SC, only to tear his Achilles in an exhibition game. Out for nearly a year, Pete had to make some money so he took and passed the exam for a sheet metal apprenticeship. Another development led to his little known, but largely productive national team career. Pete recalled an old German gentleman, an agent at the Immigration Naturalization Service, approaching him after an Inter game at Schuetzen Park in North Bergen, New Jersey. He had followed Pete from his days with West New York FC and Inter and asked, “Why don’t you become a citizen and play for the United States?” His military service didn’t immediately qualify him so he went to an immigration office in Newark to apply. The old man “sped it along” and Pete soon found himself representing his country in an altogether different way. 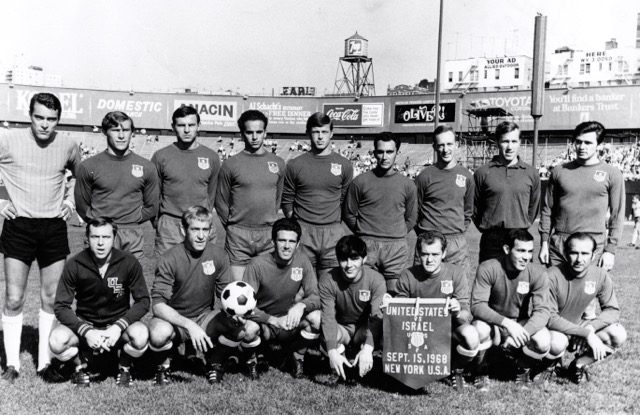 Millar, kneeling third from left, pictured with the US National team in 1968. Photo: Courtesy of Peter Millar. It was so dark that the Encyclopedia of American Soccer History doesn’t even have an entry for a man who scored eight times in thirteen appearances for his country. Millar’s first two goals came in a 3-3 tie against Israel at Yankee Stadium in September 1968, and he struck a “hat-trick” the following month against Haiti in Port-au-Prince. Technically, it was another brace, but Millar insists he scored three times. FIFA credits Willy Roy with the contested tally, even though the local Haitian newspapers gave it to Millar. He scored against the Haitians again a week later. Haiti later knocked the Americans out of World Cup qualifying for Mexico 1970, but not before Millar bagged his hat-trick. In November 1968, he tallied three goals to lead the USA to a 6-2 victory against Bermuda at Kansas City’s Municipal Stadium. Peter Millar, who also played for the Baltimore Bays in the North American Soccer League, has largely been lost in the shadows of American soccer history. But his often sun-soaked time at Boca Juniors represents one of the first times an immigrant American traveled to South America to become a professional soccer player. It was rare then, and is still rare now in the global village that is soccer. A version of this article first appeared in XI Quarterly, Volume III (July 2012). Tom McCabe teaches history at Rutgers-Newark and is currently working on a history of soccer in New Jersey. He still plays soccer, but it usually takes his body a few days to recover. Follow him on Twitter at @TomMcCabe5. I really enjoyed that article, thanks. I’m a fan of football minutiae, especially if it’s Scottish related. Never heard of Peter Millar before and had no idea someone of Scottish birth had played so recently for Boca, who I’m a fan of. Could I ask, what happened to Bobby Waugh? I’m hoping he stayed in Rosario and possibly became instrumental in the discovery of the young Lionel Messi..? Thanks again. Hi there. I know ur comment was a few years ago but My mum was Bobby’s cousin. Because he was a US citizen he was drafted in the Vietnam war and he had served one tour but was injured in combat and had significant damage to his shoulder and arm. Like many other young men he came back a different person. My mum talks about how he was this very handsome, loud and charismatic guy but was very much a broken shell of his former self after he served. Unfortunately he didn’t get to play at that level again and settled in mainland US. Think he went from the equivalent of the golden Boot one day to an average Joe the next. My great aunt jenny (his mum) had all these amazing photos of him from the 60s Inc a pic of the boca team mates with very young messier McCartney, lennon, starr and Harrison on a beach. Enjoyed your article. Very well-researched. I was a goalkeeper for the West New York Scots in the late 1960s. Went from the junior team to the reserve team to the first team. © 2019 Society for American Soccer History. All rights reserved.